Shaka Zulu established the Zulu Empire and revolutionized warfare in Southern Africa in the early 19th Century. 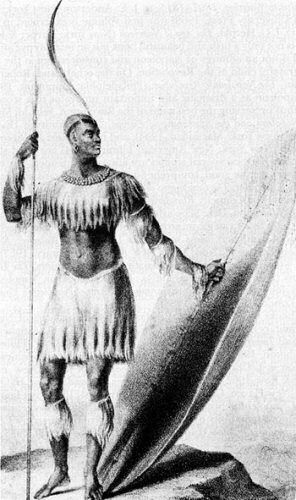 Shaka was born in 1787. His father, Senzangakhona, was a minor chief of one of the Zulu-speaking clans and his mother, Nandi, was daughter of Chief Mbhengi of the rival clan. Shaka’s birth was considered a sin because his parents were from different clans. Due to pressure from tribal leaders Shaka’s parents separated resulting in the exile of him and his mother from his father’s clan. Shaka’s mother returned to her Elangeni where she was shunned. Consequently, her son Shaka was harassed, tormented, and neglected. Shaka’s actions became simultaneously more tyrannical, ruthless and bizarre as power concentrated in his hands. In 1827 at the height of his power, his mother, Nandi, died. Anger over her death and over her (and his) treatment at the hands of the Elangeni led him to order the massacre of thousands of tribal members. His brutal treatment of his own Army nearly led to its mutiny. In 1828, Shaka was assassinated by his half brothers, Dingane and Mhlangana. Dingane assumed control of the Empire which lasted another half century before finally being crushed by the British Army. Carolyn Hampton, “Shaka Zulu,” in New Encyclopedia of Africa, John Middleton and Joseph C. Miller, eds., (New York: Scribner’s, 2008); Alonford James Robinson, “Shaka,” in Africana, the Encyclopedia of the African & African American Experience. Ed. Kwame Anthony Appiah, and Henry Louis Gates, Jr., eds., (New York: Oxford University Press, 2005).